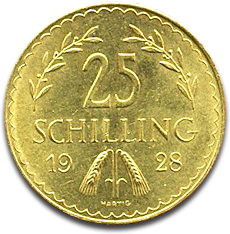 The 25 Schilling gold coins were first issued by the Austrian Mint in 1926. The Schilling gold coins, which were minted in two denominations, replaced the Austro-Hungarian Kronen. The two denominations are the 25 Schilling gold coin and the 100 Schilling gold coin. The Schilling gold coins became the official currency of Austria since 1926 when they were first issued and lasted until 1938. There were also other denominations issued of up to 2000 Schilling gold coins. In 1999 the Euro replaced the Schilling and it was the last time when the coin was issued. It has been estimated that there have been minted 276,705 25 Schilling gold coins. The 25 Schilling gold coins have a purity of 90.00% which makes these coins very attractive to investors. They also contain 0.1702 troy ounces of gold the equivalent of 5.29 grams, having a total weight of 5.8810 grams. These Austrian gold coins have a diameter of 21 mm and are graded as being uncirculated. The 25 Schilling gold coins had two different designs during the time it was minted. We have a design that is the rendering of the design from the 100 Schilling gold coin. This design was found on the 25 Schilling gold coins that were minted between 1926 until 1934. The second design features the figure of St. Leopold. On our website you will find the pictures of the obverse and reverse of the 25 Schilling gold coins from 1928. This means that this particular Austrian Schilling illustrates the first design, the one similar to the 100 Schilling gold coin. On the reverse you can see written the inscription 25 SCHILLING between two edelweiss sprays and the minting year at the bottom of the gold bullion coin divided by wheat sprigs. In small letters it is written the name of the designer Hartig who is a famous artist who worked for the Austrian Mint. The obverse of the 25 Schilling gold coins features the symbolic eagle of the Austrian Republic together with the words OSTERREICH REPUBLIK. The eagle has an Austrian shield on his breast and a sickle and a hammer in talons. The 25 Schilling gold coins are a great way to store wealth, they come in handy, and they are means of investment free of taxes. You don’t even have to declare the profit made from trading the 25 Schilling gold coins. The 25 Schilling gold coins have been produced in high quality and they are coins that can easily be found on our website. If you decide to invest in gold, which kind in fashion now due to the undesirable economic conditions, you have a multitude of options from where to choose, even if you are a novice in the field of bullion gold coins. They are also appropriate gold coin for collectors, especially for those that want to have the complete collection of Austrian gold coins. If you want to sell this type of Austrian bullion gold coins we can contact us on our website. If you decide to buy 25 Schilling gold coins we will find them at the price of EUR 253.74 which is free of VAT.